Highly accurate fit . Abrasion-resistant . Veneers can be repaired intra-orally . evoPlast is suitable for a wide range of applications, unlimited rehabilitation options, including the production of crowns, bridges, frameworks, a variety of frames, substructures, telescopes and individual abutments. mechanical properties and significant bending and bonding strength ensure the production of cosmetic structures that blend naturally in the oral cavity. The relatively neutral color helps customize the required tooth coloring and is less obvious when gums recede. It can be veneered with traditional veneer composites or other materials according to clinical preference and easily adapted to the shade and coloring of existing teeth. The product is easily modified to individual form, color and shape and is reparable in the clinic without need of a dental technician. evoPlast has great potential as framework material, both for fixed and removable dental prostheses. It is lighter and easier to work with in Labs compared to NPM, Titanium or Ceramics. There is no friction or abrasion of antagonist which helps maintain natural healthy teeth. 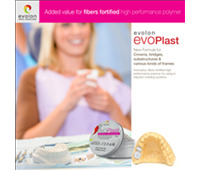 evoPlast offers dental prostheses that are absolutely biocompatible. The high pressure injection molding process with evoPlast ensures dimensional accuracy and guarantees precise results.